As part of the ongoing effort to look at the potential development of a new community and aquatics center, the City has identified a preferred site for the facility in Town Center. The City has chosen WRNS Studio to develop site designs and construction cost estimates for a community and aquatics center located at 17828 Midvale Avenue N. This is the current site of Storage Court of Shoreline. 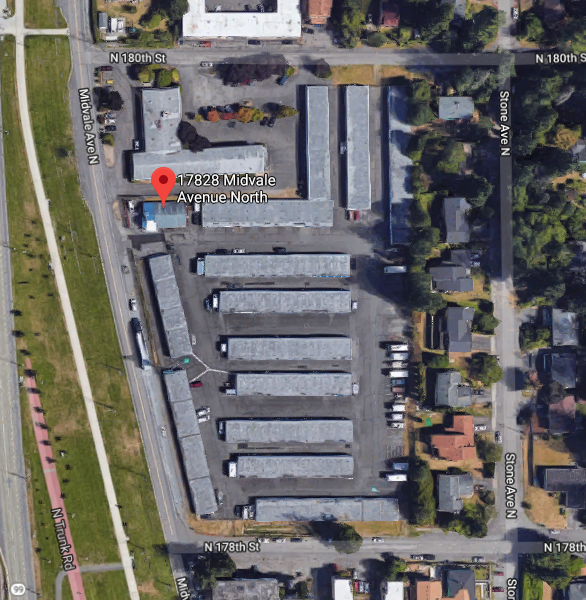 Also included in the site location are eight properties on the west side of Stone Avenue between N 178th and N 180th Streets. The City has notified the property owners of its interest in potentially purchasing the properties. However, it is possible that the final design for the facility will not require the City to purchase all eight properties. As part of the Parks, Recreation and Open Space (PROS) Plan adopted last year, the City conducted an Aquatic/Community Feasibility Study to research options for replacing the Shoreline Pool and Spartan Recreation Center. The study analyzed community needs and potential sites for a combined community and aquatic center. An important part of the feasibility study was an assessment of potential locations for the future facility. The study considered very general locations throughout Shoreline. The preliminary designs and cost estimates prepared as part of the study were based on a generic site of about 4.5 acres in size. Based on these criteria, the City determined the Midvale Avenue location would be the optimal site for a new community and aquatics center. Its adjacency to the Interurban Trail and the Park at Town Center, visibility and proximity to Aurora Avenue, and frequent transit service make it an ideal location. The location also offers the opportunity to become a signature civic center to anchor future town center development. WRNS Studio, through the proposed scope of work, will prepare designs and cost estimates that take into account the unique characteristics of this site. King County constructed the Shoreline Pool in 1971 as part of the Forward Thrust Bond program. Based on an assessment of the pool completed in 2013, it is in need of significant health and safety upgrades and other major maintenance to keep it operational. The Spartan Recreation Center is also showing its age and will require renovations if it is going to continue to meet the recreational needs of our growing and diverse community. Instead of reinvesting in these two facilities separately, the City believes this is an opportunity to combine the functionality of an aquatic center and a community center in a central location. This will allow the City to provide a better and more efficient experience to Shoreline residents. Given the level of reinvestment being called for at the pool and the future needs of the Spartan Recreation Center, the City believes this is an opportune time to develop a comprehensive, long-range plan for the pool and community center. I do not understand why you would put in another Pool when we have one on 185th and we have one on Aurora. And I understand that we don't have enough money to clean up the garbage in our streets. What's wrong with this picture and the way you're spending our tax dollars? I wish you'd take over the Fircrest facility and re-open that pool and site. The land-grabbing fanatics running this city are out of control. What was that again about "upzoning will preserve the rest of the single-family homes in Shoreline"? Oh, right... they lied. Someone explain to me why the city would condemn a local business to take their land away, when we already have a perfectly fine footprint at the present Shoreline pool. The pool is right next to the soccer field and tennis courts -- you know -- where it makes sense. The city is trying to fix a problem here that doesn't exist. If you read the article, you would understand. Why do we not expand our current pool? The existing Shoreline pool and Spartan Center are not on city land, and the school district needs to hold onto that land for future needs. Investing in a facility when you don't own the land is not prudent, so Shoreline is looking elsewhere so they can build a new fancy rec center. My question is why would the city want to build what is essentially another YMCA, just up the road less than a mile away from Dale Turner which is less than 10 years old? If they want to build it, it should be elsewhere in Shoreline. And perhaps in a location where they don't have to condemn a bunch of homes and a business. My guess is that the proximity to City Hall is a very big reason. I guess that falls under "Meets city development goals"? Good luck getting voters to pass the humongous bond measure that will be needed to make this a reality! Education is one thing but this is going to be too much.